Into Barbados we arrived, and what a change there! I was last in Barbados in 2004 and just experiencing the airport and the descent into the island, I was amazed at how much the island has developed. As quickly as we arrived and were shown through the fast-track queue by an airline representative, we left for a completely different place – St Vincent and the Grenadines. A very untouched Caribbean was waiting. The first couple of nights we spent on St Vincent, the largest island (still at only 18 x 11 miles) and the capital of St Vincent and the Grenadines. The island has a real authentic Caribbean feel where everyday life continues and I thoroughly enjoyed watching this; the busy market in Kingstown, the children noisily making their way to school, the boats coming in and out of the port. There is even a volcano to trek for those seeking active adventure. Scott Dunn are not working with any hotels on St Vincent , yet rumour has it an international airport in 2014 may bring a direct UK flight – this should bring in some more upmarket resorts. From St Vincent we took a ferry, poor man’s option but very quick, to the next largest island Bequia. Having worked in travel for a long time I was a little embarrassed to not even have heard of the island before planning this trip and shamelessly was calling it Be-quia instead of the correct “Bek-way”. Hopefully, now a fan of this charming island, I am forgiven! The hub of the island is at Port Elizabeth, not a busy port and very pretty, it is a great place to experience the local flavors at a few of the relaxed restaurants. Our driver met us in his open sided taxi, such a fun way to start the experience of Bequia. We laughed all the way to Bequia Beach Hotel as we bumped over a few potholes and rocked around in the vehicle, not entirely confident our suitcases would make it all the way! View over the almond forest that Bequia beach hotel sits amongst. 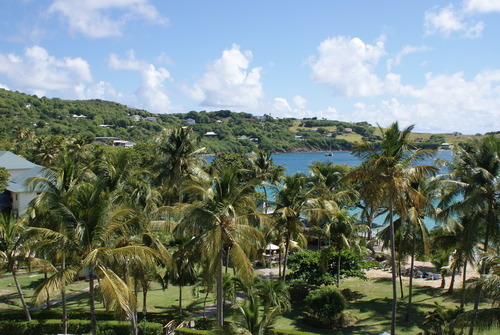 Bequia Beach Hotel is the only upmarket hotel on the island. Owned and constructed personally by a Swedish chap, who comes from the corporate industry and came across Bequia many years ago when sailing. It’s taken time and has been a real labour of love and as a result the attention to detail oozes out of the property – think Caribbean plantation, colonial charm but in a relaxed and laid back manner. This is not a Sandy Lane or a Four Seasons type place, instead a boutique property with wonderfully furnished rooms, genuine service where you can forgive the staff that they are a little delayed in whatever you may have asked for as they are sat chatting with you about Bequia and it’s way of life. 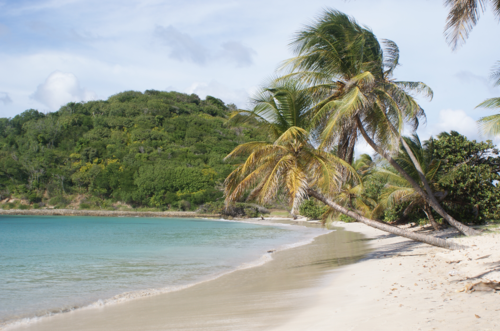 The sweeping deserted beach at Bequia is beautiful, swimming in the warm turquoise sea completely unbeatable. That evening we had a wonderful fresh seafood dinner, followed by a cheese board (that’s the European influence at the hotel!) and sat with other guests and the hotel’s team drinking cocktails. At some point we decided it would be fun to head to the local nightspot, off we went in the open side vehicle and partied until daylight to a live reggae and soca band. What a memory! 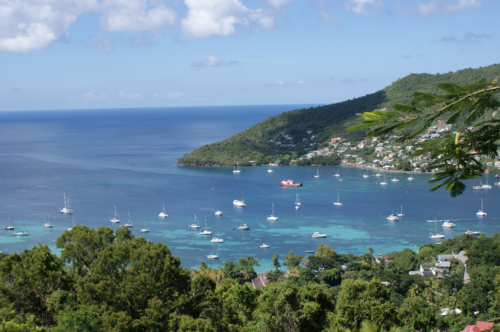 The view over Admiralty Bay on Bequia. Feeling a little sleepy the next day, we soon pepped up when we were whisked to the airport for our private jet with Mustique airways to Canouan Island. The journey was awesome, sat up front with the pilot the views were just spectacular and only from up here could I appreciate the beauty of these islands. Development is happening on a mega scale on Canouan with Canouan Resort, formerly a Raffles a hotel, now owned by the same investors at Sandy Lane in Barbados. They are rebuilding the whole resort, have already improved the airport and there are long term plans for the island. 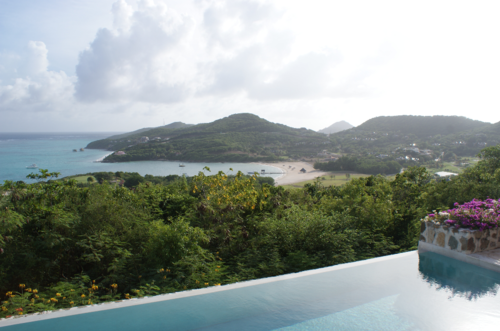 We explored the new private villas that are finished at Canouan, and they are incredibly beautiful with large private pools, exquisitely furnished and touches that would give any one house envy! Canouan also has the only golf course in St Vincent and the Grenadines with spectacular views too. We then donned our hard hats and explored the most exciting development in the Caribbean at the moment, a 50 room boutique property, rumoured to be the “New Sandy Lane”. Very similar in style to its big sister and no expense spared, this currently unnamed hotel is more contemporary and slightly more tasteful in my opinion than Sandy Lane. The suites just took my breath away on detail with every single element, the leather handles on the wardrobes were my favorite and a disappearing TV – genius ! The resort is unlikely to be finished for another year, but I am incredibly excited about sending some of my guests here who love staying at the best places – it will certainly come with a price tag! The investor himself showed us around and it’s fascinating to see a hotel in its construction stage and here the level of detail in the planning surpassed any hotel I’d ever visited at construction stage before, the secret staff corridors so that guests are not to see room service being delivered and the design of the pool so that no guest will have an interrupted view when relaxing on a sunbed! View from one of the finished villas at Canouan resort, as far as you can see in the image is a sneak preview of the new boutique resort. 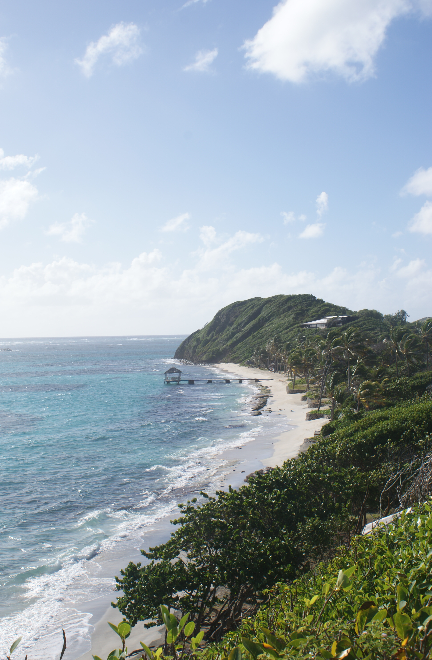 Now for my favorite part of the trip – the next morning, we boarded our privately charted catamaran from the Tamarind Beach Sailing Club pier and headed off to the Tobago Cays, passing little uninhabited islands. As we sailed into the Tobago Cays the color of the water just became progressively more turquoise blue. Snorkelling alongside Turtles here was something I will never forget, at one stage I was close that I could have touched the turtle, really magical. The waters this day were a little choppy making snorkeling hard work so we all we relaxed for a while on an island of sand deposited by the waves whilst our colleague, a Yoga instructor, gave an impromptu lesson! We then sailed for a well-earned lunch on a small island just a short sail away, the menu consisting of freshly caught Lobster and a cold local beer. Back on the boat we sailed to Mayreau island, palm tree fringed with no hotels. The little beach bars are a fun place to hang out for an hour or so and we got chatting to a local boat builder who demonstrated the genuine friendliness of the Vincy people was evident. The deserted beach at Mayreau. The final leg of the sailing trip was to Petit St Vincent, a completely private island hideaway. Here I believe I found paradise! Run by ex Aman hotel managers this is the only place in the Caribbean I have ever experienced service as good as in Asia. With no internet, TV’s or phones in the rooms, just a flag service that works remarkably well you can truly relax. The team at the hotel drive around in mini moaks and most of the team have been here for a long time, in fact one chap in his late 70’s has been here since her was 14 years old and the bar is named after him! The 22 cottages are either on the beach or on the hillside (bluff) with the most incredible views. Simple yet elegant is the best way to describe the resort, from the rooms to the dining. 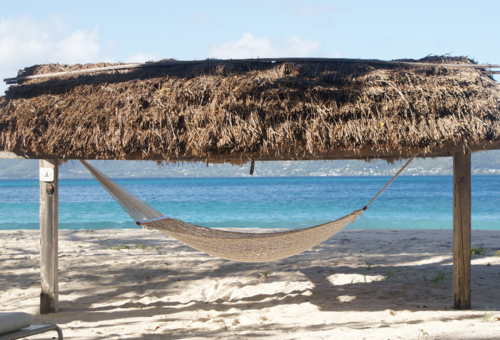 Waking around the island takes about an hour and on the way you’ll find hammocks to chill out in or incredible viewing points looking over to Grenada or Petit Martinique. Water sports, diving, snorkeling tennis, outdoor gym, spa; there is plenty here if you need activities bit this is really a place for those who love a barefoot, outdoor experience and are looking for a private island paradise. If I was to choose a honeymoon destination, this would be it! Normally by the end of work research trips away I am ready to get home, see my husband and daughter and get back to normal life, however St Vincent and the Grenadines captured me so much I just wanted to fly my family out here and stay forever! This is a Caribbean for those who have a love for remote, unique places and don’t mind that tiny extra hop to get here. It’s not the bling of Barbados or the sophistication of St Lucia but it’s an authentic, safe, genuine and non-intimidating Caribbean which I highly recommend a visit to now before everyone else realises this! Thank you to SVG Tourist Board for inviting me to experience this!